We have had our little play kitchen for three years now and it's still played with regularly by both of the kids. Little Man loves to chop the fruit and make coffees, while Miss M feeds her dolls. 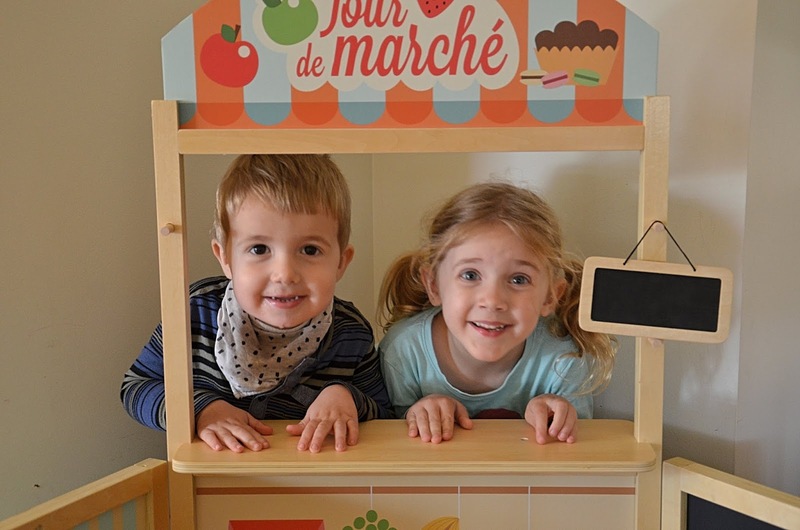 Pretend play is such an important part of early childhood development for so many reasons (which I'll get into later in the post). After a while though, it's always good to change things around and provide different play opportunities. We were lucky enough to be gifted this Large Retro Grocery Store thanks to Tiny Tiny Shop Shop. So we've relocated the play kitchen to another part of the family room to make room for the shop and to provide some new play opportunities. The kids are absolutely loving it and they are surprisingly playing really well together! Gifted for the purpose of this review. So on the first day that they were playing with it, I wrote down everything that they said (it reminded me of back in my uni days when I would take running record notes on the children I was observing). And it was really interesting to watch them interact and especially to see how much Little Man was learning from Miss M. (So Little Man's words are in italics and quotes, and Miss M's are in plain text. Hopefully you can follow along!). Do you want me to put some food in there for you? What have you got in here? You’ve got some carrots don’t you? Would you like to buy some more food? Would you like to buy some milk? Alright alright alright. Let’s get another one. There you go, would you like to buy it? * Roles reversed based on who had credit card machine. One banana . No I already had an Apple. I want one mushroom and one of these. Now my bag is full I need to get another bag to put my groceries in. * Little Man started saying the numbers on the credit card machine. Can I buy all of these? I’ve got lots of money. Let M put her special numbers in. E can M buy all of this now? Can you do my number in? Do you want me to tell you my number? Pop the card in. Good boy. Now can M go pop it in her house. 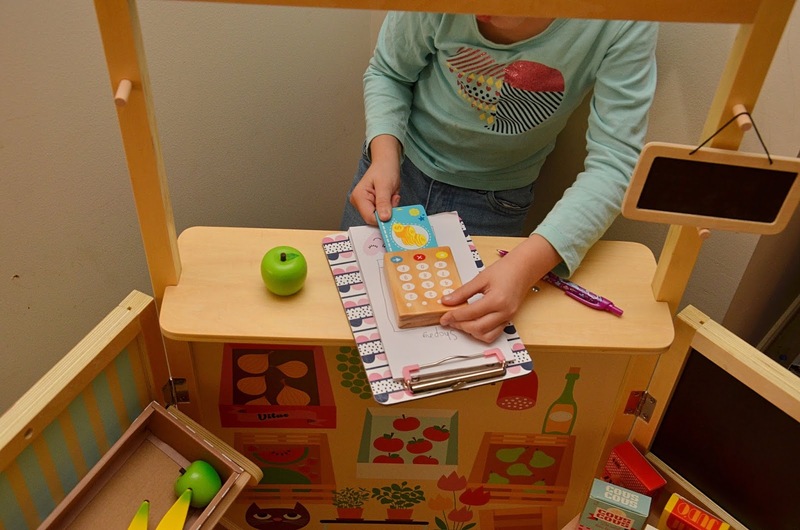 So how can "shop play" be an educational experience for young children? 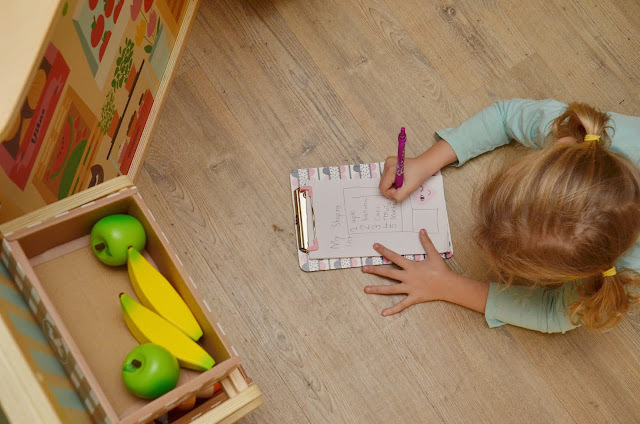 As you can see from the above conversation and interaction between the two kids, shop play provides a great opportunity for language development. Counting coins and money (adding up money for older children). Counting how many of each item they would like to buy, eg two apples and three bananas. Writing price tags on food items. Negotiating and turn taking, who will be the shopkeeper and who will be the customer. Sorting the food into healthy food/sometimes food or sort the food into food group categories. This can include how you set up the grocery store. The vintage grocery store itself is really cute! 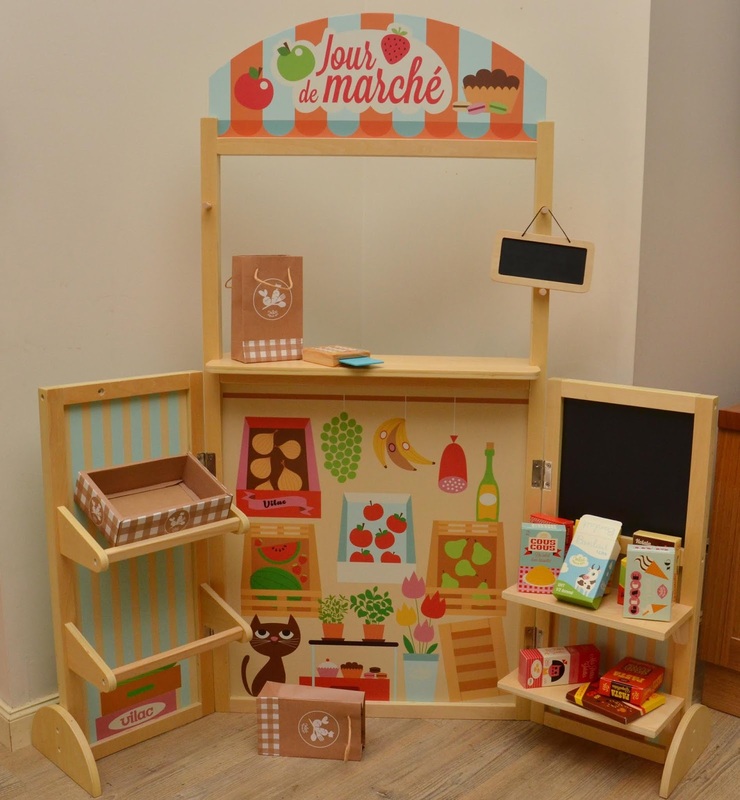 It has little shelves for all of the products to go on and a window opening for the shop keeper to stand behind. The little chalkboard is perfect for writing the daily specials and my kids favourite part is the card reader!! (I love how they’ve made it modern). The wooden food is of a beautiful quality, I can tell from experience that it’s the kind that will last. And the set also comes with some sturdy cardboard box products as well with easily identifiable pictures. There are heaps more kitchen accessories available to compliment the grocery store here.